AC36, develan el nuevo AC75 foileador para la próxima edición. An exciting new era in America’s Cup racing has been unveiled today as the concept for the AC75, the class of boat to be sailed in the 36th America’s Cup is released illustrating a bold and modern vision for high performance fully foiling monohull racing yachts. The Emirates Team New Zealand and Luna Rossa design teams have spent the last four months evaluating a wide range of monohull concepts. 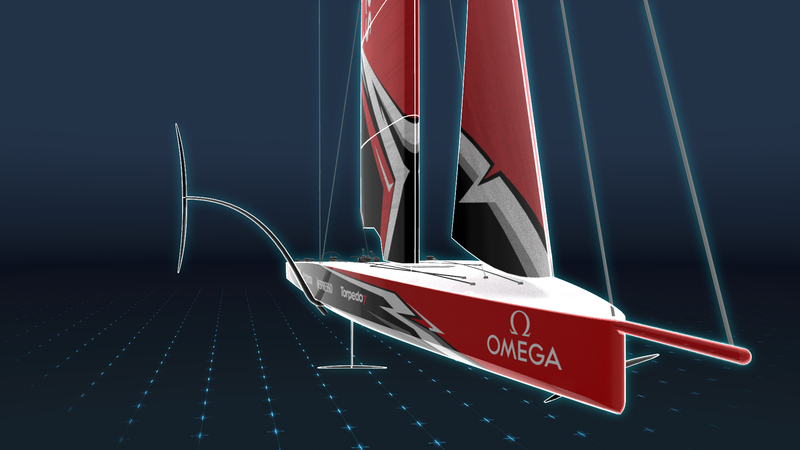 Their goals have been to design a class that will be challenging and demanding to sail, rewarding the top level of skill for the crews; this concept could become the future of racing and even cruising monohulls beyond the America’s Cup. The AC75 combines extremely high-performance sailing and great match racing with the safety of a boat that can right itself in the event of a capsize. The ground-breaking concept is achieved through the use of twin canting T-foils, ballasted to provide righting-moment when sailing, and roll stability at low speed. 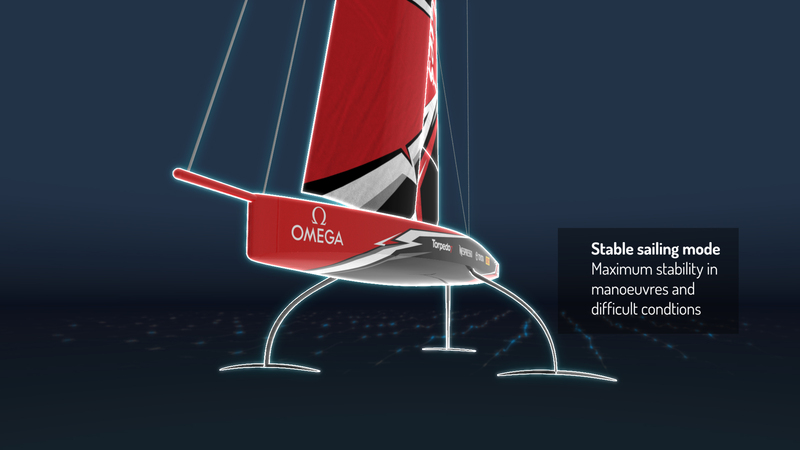 The normal sailing mode sees the leeward foil lowered to provide lift and enable foiling, with the windward foil raised out of the water to maximise the lever-arm of the ballast and reduce drag. In pre-starts and through manoeuvres, both foils can be lowered to provide extra lift and roll control, also useful in rougher sea conditions and providing a wider window for racing. Although racing performance has been the cornerstone of the design, consideration has had to be focused on the more practical aspects of the boat in the shed and at the dock, where both foils are canted right under the hull in order to provide natural roll stability and to allow the yacht to fit into a standard marina berth. An underlying principle has been to provide affordable and sustainable technology ‘trickle down’ to other sailing classes and yachts. Whilst recent America’s Cup multihulls have benefitted from the power and control of rigid wing sails, there has been no transfer of this technology to the rigs of other sailing classes. 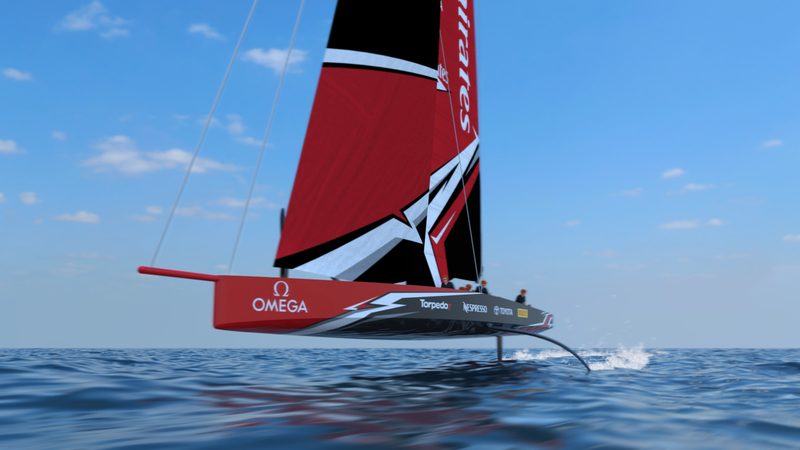 In tandem with the innovations of the foiling system, Emirates Team New Zealand and Luna Rossa are investigating a number of possible innovations for the AC75′s rig, with the requirement that the rig need not be craned in and out each day. This research work is ongoing as different concepts are evaluated, and details will be released with the AC75 Class Rule before March 31st, 2018. The America’s Cup is a match race and creating a class that will provide challenging match racing has been the goal from the start. The AC75 will foil-tack and foil-gybe with only small manoeuvring losses, and given the speed and the ease at which the boats can turn the classic pre-starts of the America’s Cup are set to make an exciting comeback. 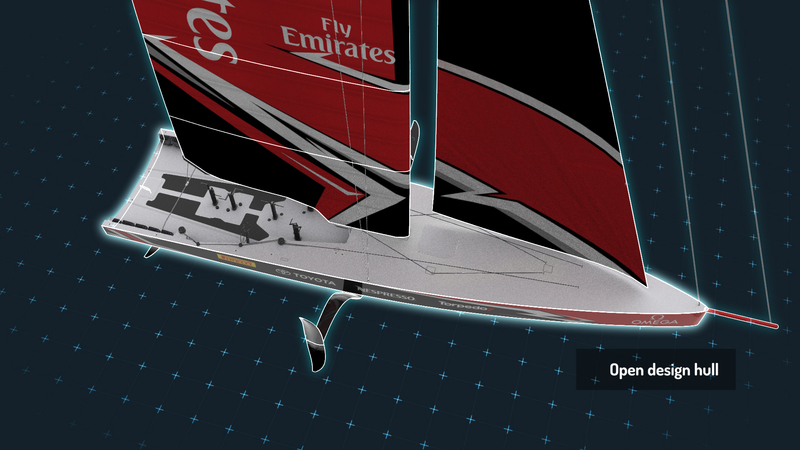 Sail handling will also become important, with cross-overs to code zero sails in light wind conditions. A huge number of ideas have been considered in the quest to define a class that will be extremely exciting to sail and provide great match racing, but the final decision was an easy one: the concept being announced was a clear winner, and both teams are eager to be introducing the AC75 for the 36th America’s Cup in 2021. The AC75 class rule will be published by March 31st 2018. “The choice of a monohull was a fundamental condition for us to be involved again in the America’s Cup. This is not a return to the past, but rather a step towards the future: the concept of the new AC 75 Class, which Emirates Team New Zealand and Luna Rossa design teams have developed together, will open new horizons for racing yachts, which, in the future, may also extend to cruising. 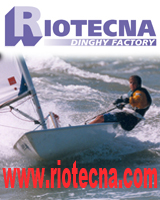 It is a modern concept, at the high end of technology and challenging from a sporting point of view, which will deliver competitive and exciting match racing. I would like to thank both design teams for their commitment in achieving, in just four months, the goal which we had established when we challenged”. “As a sailor I am very pleased of the concept jointly developed by both design teams: the AC 75 will be an extremely high-performance yacht, challenging to sail, who will require an athletic and very talented crew. Every crew member will have a key role both in the manoeuvres and in racing the boat; the tight crossings and the circling in the pre-starts – which are part of the America’s Cup tradition – will be back on show, but at significant higher speeds. It is a new concept, and I am sure that its development will bring interesting surprises”. si, se entiende poco la nueva idea. Características de navegación de un monocasco como se pedía, nada. ¿más de lo mismo? El desafio tecnológico que lleva bajar esto a la tierra es brutal. dos orzas como no se habían visto nunca. En barlo hacen de contrapeso, y en sota de foil. De foil con todos los controles de ángulo y demás de un foil con una orza que será varias veces más pesada que un foil normal. Luego está todo el asunto de la estabilidad, con sólo dos puntos de apoyo y con mucha menos manga, palanca que un cata. Además que van a navegar en aguas mucho menos protegidas que en Bermuda, con olas y corriente. 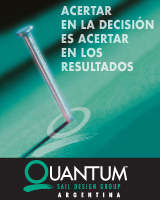 Las regatas no se cómo resultarán, pero estos tres años y pico de desarrollo serán super interesantes. Coincido que va a ser muy interesante ver como esto pasa del render a la realidad. Pero veo difícil que los costos de esta copa no se vayan a la estratósfera. La anterior versión era una plataforma moderna a un costo relativamente bajo con casco one design, alas one design, etc. Esto no sabemos donde va a terminar ni cuantos equipos estarán dispuestos a invertir en este transformer. Igual me gusta ! !